Today’s guest post is from commenter Megan. So, let me break it down for everyone—some of us living outside of the Mormon Belt don’t really like the Mormon Belt. It’s nothing personal, it’s just, well, let me explain. I live in Michigan. I was born and raised in Michigan. I became a Mormon in Michigan and have spent the vast majority of my life here. My entire extended family is from Michigan. The closest connection I have with anyone living in the Mormon Belt is people who have lived in my ward at one time or companions I had on my mission. Frankly, the biggest connection I have with the Mormon Belt is that, well, I’m a Mormon. Growing up as a Mormon in Michigan left me with a little bit (or a lot) of a chip on my shoulder. Because there were always some Mormons from out West who were just passing through, who lived in my ward for a couple years or so, who just would not shut up about how much better everything was in Utah. They would talk, with condescending voices, about everything we were doing wrong, about how much they struggled to live in the “Mission Field” (man I hate that term), about how much they missed the mountains, etc., etc., ad infinitum. Okay, I totally get the last one. When I’ve lived outside of Michigan I’ve totally missed the Great Lakes (and the little lakes), and the trees, and, yes, even the snow. It was the condescension, that smug sense of superiority, that really got to me—the sometimes unspoken (but frequently spoken) assumption that everything they did out west was great and everything we did was crap. They showed little respect for our history, our culture, our home, while they lorded it over us that they were from the Promised Land and that we would always be shut out. Growing up, I hated it. And I kind of hated Utah. I know, I know, that’s not the most mature reaction to have, but it’s how my child and teenage self handled that kind of disdain. Sometimes it felt, and still feels, like we don’t exist, or that we don’t matter. And I’m from Michigan, right in the middle of the good ol’ U.S. of A. I can only imagine how it must feel for someone from outside of the U.S. when they smack up against these kinds of attitudes. How much a part of Zion do you think they feel? Thank goodness for President Uchtdorff. I’m so glad that there’s at least one General Authority who really and truly knows what it’s like to be from somewhere else. I love my home. I love being from Michigan. I love what I’ve learned being a religious minority, the way it’s opened my eyes and helped me not only understand people of other faiths, but how to find common cause with them and learn from them. I love my heritage, the way my family discovered Mormonism and how we have stubbornly stand our ground in it, without ancestors to guide us, without that deep Pioneer heritage that so many Western Mormons rightfully hold so dear. I am who I am because of how those twin snakes of Michigan and Mormonism have wrapped around my life and led me down this sometimes treacherous, sometimes joyful, always exciting, path. I may not understand your jello salads, and I may call them cheesy rather than funeral potatoes. I may not have an ancestor named Nephi (or Hiram, or Ammon) and no one in my family ever crossed the Plains. But that doesn’t make my Mormonism less real or my heritage any less rich. I am the child of Irish immigrants who found a place where they could flourish, of Scots and Germans and Brits who settled in this green and glowing land. My family has served and sacrificed for country, religion, and family. I am proud to be a Mormon and I am proud to be a Michiganian. I live in God’s Country. You should come for a visit. Thanks Megan for the post. I appreciate your position, and being from Australia, much of what you said resonates. I blogged about this in my post http://www.wheatandtares.org/19172/not-of-the-heart/. The centralisation of the church has many good qualities, however the further away you are geographically, the less beneficial they are. Speaking purely from my point of view, the Utah (church) culture comes across as being white centric, business oriented, fake and self interested. Many aspects of that culture are offensive towards our culture. I will temper these comments with the fact that I have many friends in Utah, and have lived there for a short time. Some of the most beautiful people I know are from Utah. And yes, Michigan sounds like a beautiful place. If you think it’s bad, try living here. The 20% of people who are insufferable feel like 90%. It is an indication of an inferiority that manifests as a smug superiority. A Zion label without the Zion society. And all is well in it. 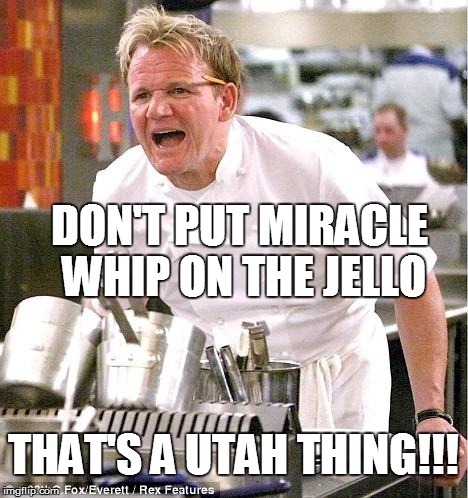 I hope you mean Cool Whip, rather than Miracle Whip, on the Jello. Yes Miracle Whip in Jello would be truly awful. Cool whip is much better, although I’m not much of a fan of jello. Megan, Did you know Michigan has its own Mormon history? Have you been to Beaver Island? After Joseph Smith was killed, a man he had baptized a few months earlier in Nauvoo believed an angel anointed him prophet and he started a different brand of Mormonism. His name was James Strang and he was killed on the shores of Lake Michigan. I heard an interesting presentation at the Mormon History Association meetings a few years ago. Just curious if you’ve ever been there. As someone who is about as Utahn as it is possible to be (I don’t have a single ancestor born outside of Utah after the 1860s), I agree with this post. I always think that church would be much less difficult for me if I lived “in the mission field.” I loved how ward were run when I was on my mission, and if it weren’t for all my extended family living in Utah, I would probably leave. And I agree with Silver Rain that the insufferable people make up a minority, but they are so loud and overbearing that it feels like they make up a majority. Even though Idaho is somewhat in Mormon valley – we got the added layer of cross-state rivalry crapping on each other. Which leads to even more inferiority/superiority issues (cough, Rexburg). We have some deep seated insecurity issues. btw we’ve lived in 4 states in 4 time zones. I loved living “in the mission field” best. I just felt more at home. Well said, Megan! I’m very glad for the confidence and pride you have in yourself and your legacy. LDS_Aussie: Yours is the post I remembered! Well, I remembered it after I submitted mine above. So, yes, amen to everything you previously said. Also, in a weird sort of kismet, this post was inspired by a remembered conversations my brother and I had with some Australians (while I was visiting your lovely country) about our, ummmm, shared disdain for Utah. Disney was right, it really is a very small world. SilverRain: And that is why I’ve never wanted or tried to live there. I’ve met and known some really, really fantastic people from Utah and the Mormon Belt, people I instantly clicked with and were just all around great people, but that 20% would ruin it for me. But I really should visit (I don’t think being in the MTC really counts as getting the Mormon Belt Experience). The feeling of being surrounded by Mormons would be an intriguing novelty. Plus there are a bunch of Church history sites and national parks I’d love to explore. Grew up and graduated from college in UT, but have lived nearly my entire adulthood outside UT. I always hated the question, “where are you from,” followed by “are you a Mormon?” Now I name the state I’m currently living in instead of where I grew up. There exists–or existed–a certain underlying inferiority complex in UT Mormon culture that results in the need to tout one’s “greatness,” which then turns into pride and smug superiority. Pride is a problem in our church–probably more so in UT culture. I’ve always found it somewhat humerous the need to highlight people who are famous and also Mormon. I swear the church owned paper, Deseret News, for awhile had an article nearly every day touting UT as being the “best” in some category. I think they had a person assigned to just scour rankings and lists looking for UT. I also find it interesting when new policies come from the church, such as the changes in missionary farewell activities a few years back, because often they reflect something has gotten over-the-top in UT. But usually outside UT things weren’t out of control and so the new policy can result in a more stringent interpretation. I find it curious that UT Mormon culture can remain so insular and rigid despite so many young men/women having served missions in different parts of the country and world. I’m glad I’ve had the opportunity to live in different parts of the country. There are things I loved and things I didn’t care for in every place. We can learn much from others, and we have much to learn. I was born and raised in Utah, but both my parents were raised in California and were pretty open about rolling their eyes at Utah culture. One of my favorite aunts outside Utah would always whine specifically about “East Bench Culture” (a reference to a more affluent area of the Salt Lake Valley where many of the GAs lived… and where I lived. She was trying to make a point.). I didn’t live outside Utah until after I was married. We spent a decade bouncing around Colorado and Nebraska. It was a bit of a culture shock, but the wards and people I met were awesome. After awhile I finally saw for myself that smug superiority that people had tried to describe about us members from the Mormon Corridor. I got to the point where I was glad we wouldn’t be moving back to Utah. Then, of course, the job we had lined up for years in my husband’s hometown fell through and a really good position fell into his lap in Salt Lake. So we moved to Utah, and I now live within a couple miles of where I grew up (I can keep a closer eye on my widowed mom, which helps). There are perks and drawbacks, but I’m happy living here now. Seems like for those of us not from Utah, our experience has a common thread. One thing I really did like in Salt Lake is that there was a subculture because Mormonism was big enough to have different varieties within it. And I really liked the people who are down to earth. My in laws are great. It’s just the unstated assumptions, and the Utah Mormon exports who want to impose their cultural norms on other places who are irritating. Except for attending BYU, I’ve never lived in UT. Growing up, I always kind of felt sorry for people who lived in UT, and I don’t know if that was my parents’ bias (they were both from there) or the bias of other members of the ward. “Utah Mormon” was a derogatory term – it meant anything from ignorant to apostate to judgmental. We had a lot of visitors to our ward from UT, I never really felt like they had anything I might be jealous of. I found myself leaving for BYU with a mild prejudice against the state and people, and was surprised when I got there with how many Utahns just loved the place. They loved it so much, I decided it couldn’t be all bad. I should add that I confess I always had a certain type of prejudice because of this conflation of culture with the gospel that those from Utah didn’t really “get” the gospel because they couldn’t distinguish it from their own culture. I still think that’s true for many, but there are also good people who do understand the distinction. And I never heard the term “mission field” until I was nearly 20 years old. What a stupid thing to call the whole world, particularly when missions with Utah have some of the highest baptism rates. Martin, when I was growing up in Utah I always understood the term “Utah Mormon” as gerogatory classification of someone less devout. Someone who identified as Mormon with obligatory cultural nods but didn’t really care about the gospel. It wasn’t until I kept getting called a “Utah Mormon” at BYU that I found out others were meaning something different. They honestly had no clue why I balked at accepting the label since I was born and raised in Utah. I’ve had a number of positive experiences with people from Utah. That said, it is human to conclude that whatever culture and origin you have is the best. If you’ve dealt with “fill in the blank ” you’ve experienced that. I have heard of Beaver Island! Though I’ve never been. Probably because I didn’t really learn anything about it until the internet became a thing. Both Mormons and Michiganians had kind of buried the story, Mormons because it wasn’t part of the correlated history taught in Sunday School and Seminary, and Michiganians because it was a little weird, a little out there, and just a little bit shameful. I really should pick up an actual book about the Strang-ites and take a trip to the island. I’m of the opinion that all kinds of history needs to be remembered, the weirder the better. I assumed from the context of the conversation that she meant that I wasn’t very judgmental of those who didn’t fit the Mormon mold and I wasn’t scared of “outsiders.” I can only thank my unorthodox parents for that. But I have to write this love note of a comment to the Utah transplants in our struggling branch who helped make it go and loved me unconditionally and uncritically. They were the people that made my parents want to become Mormons in the first place. But I do get the love-hate relationship. I regret any time I spent feeling like an outsider in Utah, less than, or out of place. And I regret that my church identity more or less prevented me (in my particular situation) from forming a strong sense of myself outside of it. Anyone mixing mayonnaise with Jello would be a sick individual. Topping jello with whip cream isn’t so bad though. Mixing cheese, cottage or cheddar, into jello is just abominable. Gross. But then again, I’m not a jello fan anyway, so I don’t think I’m the target demographic. There are plenty of Utahns in this area, but most are long-term residents who are locally acclimated. It also helps keep the smug attitude down when the 2 former stake presidents and the current stake president are all from here or even further from Utah. Many of the former Utahns are like me and have not lived there for 20+ years, but still have plenty of family to go visit during the summer. Many older couples will move to Utah when they retire because all or most of their kids/family live there. I’m late, but…another Michigander in the online Mormon world? Be still my beating heart. Sending Mormon Michigan love from North Oakland County! I’m proud to have grown up outside Utah, and happy that I don’t live there now. And I’m also happy be married to a Utah native with deep, deep roots there. “That’s a Utah Thing!” has long been my knee-jerk teasing response to any of my wife’s quirky sayings, pronunciations, culinary ventures, craft projects, or pretty much anything related to LDS life that doesn’t have relevance outside of the mountain time zone. All in good fun. Sometimes, though, I’m on the receiving end of the teasing. Like in the last GC, when Elder Holland gave the final talk of the last session, and he mentioned something about traditionally having ice cream after Conference. Specifically, he framed it like it was a thing that everyone just did, like it was a longstanding church-wide tradition that all Mormons are supposed to know about. Filled with betrayal, I gave my wife an enraged look and shouted “WHY HAVE YOU BEEN KEEPING THIS FROM ME?! You’re from Utah, you were supposed to tell me about all of these things! I feel so cheated!” She casually replied, “Oh yeah, we used to have ice cream after Conference when I was a kid, I forgot about that” while I was flooded with the memories of a lifetime of boring GC sessions I suffered through, which would have been considerably more bearable had I known a fudge sundae was waiting on the other end. Thus I declared by proclamation that in our house, there will be ice cream following every future General Conference, as the practice now has an apostolic blessing. But I digress. I don’t like the way worldwide Church policies are influenced by Utah culture, as if theirs is the only one that matters. But I am also grateful to be living in a state where the dominant religious body does NOT constantly poke its nose into political or social issues. And, as Hawk mentioned earlier, I wish I had been able to experience more diverse shades of Mormonism in my formative years, rather than the ultra-conservative all-or-nothing monoculture I knew it to be (and occasionally disagreed with or felt excluded by). Had I grown up in a higher concentration of members, I would have been more likely to find others more like me, and I might have really enjoyed being LDS rather than resented it as I often did. brandt: Woohoo another Mormon Michigan voice in the bloggernacle! It can get a little lonely out here. Sending Mormon Michigan love from Mid-Michigan back out your way! @Mary Ann: where in Nebraska have you lived? I grew up in Papillion, lived in Lincoln for a while, and now live outside of Columbus. Teaching elders’ quorum on the 24th of July five years ago, before getting into the lesson on service I noted, “This date marks the occasion that those settlers of what would become a great city arrived at their destination and disembarked from their canoes. Yes, canoes. It was on July 24, 1701, that Cadillac arrived at Detroit.” Every Michigander has cause to honor the 24th of July thanks to Antoine Cadillac and his band of voyageurs. I was raised on the West Coast and both of my parents are converts. Until I attended BYU I didn’t know anything about the Utah/Mission field divide. After we graduated from BYU my husband ((born and raised in Midwest) and I lived on the East Coast and then the West Coast. The majority of both of our extended families live outside of Utah. He got a dream job at BYU and so we moved to Provo when our 4 children were under the age of 12. We purposely selected a diverse neighborhood and set of schools. All of our children have had immigrant and non-member friends. I didn’t fully appreciate the divide until my daughter went to EFY in Texas with one of her cousins. On the first day, they did a roll call by state with teen-agers standing up and cheering when their state was called. The last state they called was Utah. My daughter, with a few other kids, stood up and cheered and the entire group of kids loudly booed them. Years later, my kids started attending BYU. There they have had students make fun of them and refuse to date them because they are from Provo. People will literally walk away from them mid-conversation when they find out where they live. It’s like they take all of the prejudice they experienced in their home towns for being Mormon (I get it. I got plenty growing up myself) and direct it to the local Provo students. And som how it is completely acceptable to label and judge. Like on this post. In Provo I have been able to find a nice- sub-group of liberal, intellectual Mormons here. The suburban wards in Washington are pretty conservative. However, the legislative season here – a truly ugly mix of conservative religion and politics makes me crazy every.single.year. I can’t read the paper during the month of February. Other Doug, we were in the SW area of Omaha (192nd and Q) for 3 years. Our ward was in the Omaha Stake, but we bordered wards and branches in the Papillion Stake. Of the 10 years outside Utah, we did 4 years CO, 3 years NE, and 3 more years back in CO.
Elsie — Just read that myself and liked it. John Mansfield: I am going to remember that and use it. Somewhere, somehow, I’m going to use it. What fantastic kismet. Anon: It is horrible that your kids had to go through that booing at EFY. There may be some cultural consternation but no one should ever, EVER, be such a jerk about it. And you raise an interesting point about finding a like-minded group in Provo, especially in comparison to your experience in Washington. That is one of the big benefits of living in a more Mormon populous region. As someone living in a Mormon minority region, I’ve never really found that kind of group. I’ve always found the most like-minded people outside of my religious community. So yeah, there definitely are benefits. Wow! You have a lot of vitriol against Utah Mormons! I went on a mission to Michigan, and I assure you that neither I nor any of the missionaries I knew thought we were better than the people in Michigan. We treated them as if they were ordinary people. We treated the Mormons there as if they knew the gospel as well as anyone we had ever known in Utah. Were we supposed to treat them differently? I’ve heard that there is some sort of superiority complex among Utah missionaries, but it certainly didn’t seem to be in existence in 1980-1982. Toni: I didn’t make this clear in my piece and I’m sorry for that–When I used the term “Mission Field” I wasn’t talking about missionaries at all. I’ve been a missionary and hold that service as one of the highlights of my life and I would never set out to purposefully attack any other missionary’s service. My use of the term comes from an attitude that some people (a very vocal minority, as pointed out in a comment above) who purposefully moved into my ward, my state, and and wore their superiority on their sleeves. They called us, and anyone who didn’t live in a Mormon majority area, the “Mission Field.” They acted like they had come to the savage wilds to civilize us and, yes, it was an attitude that rankled. I promise, I don’t feel any vitriol towards anyone from any of those areas. And as evidenced by other commenters, I’m not alone in having experienced that kind of attitude. But, like I said, I am most definitely NOT talking about missionaries. And I’m sure that you and everyone you served with did so with live and charity. Thank you for your service. Toni – Just because you and other missionaries that you saw did not treat people like you were better than them does not mean that others do not. In missionaries I have seen wonderful ones and really awful ones. Recently, I went a website that the church has (it could be mission-specific) where missionaries can post letters to their loved ones back home. I quit going on it (I can’t even remember where it was). I was curious to see what missionaries that are serving where I live thought about their mission. Let’s just say I was disgusted with what I read. They referred to certain towns as “ghetto” and said some really horrible stuff. Almost to a person, the only area that any of them seemed to love was the really wealthy area in the mission. I wanted to print off the letters and send them to the mission president and tell him what I thought of it. To be honest, I do see that attitude in some of the elders that stop by–not all of them. Some are the sweetest people and they are really enthusiastic about their missions. But others really have a ‘tude. Luckily the one that told my husband that he “must not have been born under the covenant” would have been thrown off the porch had I been home. I would have spanked him and sent him back to his little momma for being such a jerk. Rude and disrespectful is not good missionary material. The point is–some are great and some are not so great. But don’t say you “never” see that attitude among members or missionaries because it is there in some of them. I grow very tired of the bashing that people from Utah seem to get on a regular basis, particularly from those members who have never even set foot in the place! I grew up in Utah as a non member. I was quite familiar with how the LDS culture was there. I then moved down to the southeastern U.S. and joined the church there. Upon hearing that I was from Utah, the tone of some of the members I met quickly changed from positive to a negative one. I was being judged as a “Utah Mormon” without them even knowing my background!! I had just become a member in the southern state, yet it was assumed that I would be just like “one of those people from Utah who knows everthing”!! The truth is I never even said anything about the church in Utah, I kept my opinions to myself. I was astounded when even the Bishop of one ward I lived in lectured me (unsolicited)that I need to learn that the church was no longer a “Utah church”. The point I make is that the smug attitudes are to be found on both sides, both from Utah and the so called mission field areas. There are far more important issues that we as members of the church should concern ourselves with, and forget the childishness of who’s better, us or them? That should go for those of us from Utah and are proud of our home state, and those who have joined in another area. In short, GET OVER YOURSELVES! AND.. just as an aside… This attitude issue is not unique to LDS members alone. Some in my family are Jewish and some are 7th Day Adventists from the Northeast and California respectively. The same attitudes are found in those communities, the Jewish people from New York who have moved south, and the Adventists who have moved down to North Carolina from California. The same things are said about them too (that they are smug know it all’s)by the local people!!! Simply, let’s just drop our attitudes and get on with living life! Wherever we live. I have arrived at this post rather late. However I am an Australian lived and studied in the east as well as Utah for a number of months, all over I have spent probably close to 2 years in the US. I must say upon my initial arrival in Utah I felt a sense of enclosure and an uncomfortable alienation as a ” foreigner” included my wife and kids. Having said that I too have some very lovely friends in Utah but what I find is the most uncomfortable part of Utah is the cultural imperialism and all that entails, which inhibits the churches growth. Perfectly illustrated on our mission in Eastern Europe where we were constantly reminded of our ” secondary position” as non Americans but more significantly non Uthans! The classic quote was ” we are placed in Utah for a reason..by God so you better get used to it” this was in response to a disagreement and this was meant to put me in my place. There are many such examples including our friends, Australia’s who were born in England live there until there 20’s. They served in England as a senior office couple……they rang late one night from England absolutely distressed and ready to come home the next day …this after a year of wonderful service….the problem a new Mission President from. Utah and 2 new office helpers from Utah…..I won’t go into the ” cultural superiority issues but there is a well inbred sense of ” we are the only ones who know”….. Thus this is why God obviously placed us here ! There are obviously wonderful church members who are “normal and open” to another view of the world. I have always thought that the Lord set up a most wonderful possibility for producing THE most rich culture and civilisation by sending out its young to the 4 corners of the earth, experiencing how others See and solve issues and especially via new languages which by their nature introduce you to levels of meaning and understanding…….However to me it has failed the Lords offering ..many of the young do not stay or the ” mother” culture is far too dominant. I am very well aware of the cliqueishness of Utah people. I was born there and grew up there. I moved to Arizona several years ago and claim that as my home state now, even though I’ve been in Utah the last couple of years. As I was growing up, some of the ways many of them have treated non-members or others not like them have been very painful to experience, see, or to hear about. I was blessed to have a mother who didn’t have that mentality. And it isn’t really part of my reality right now. When I was a kid in the 60’s in the midwest, my mother, who is from a long line of Scotish/English Protestants that came to the New World prior to the American Revolution, frequently made green Jello, with pear halves (from a can) in it, and a maraschino cherry placed in the hollowed out part of each pear half. I remember the pears being perfectly lined up in rows. It was served topped with Cool Whip. I believe it was a 1950’s cultural recipe thing, and it just stuck around in Utah longer than other parts of the country.